hen the car making industry started, there was no such thing as premium cars or mass market cars, hatchbacks or sedans or wagons. What the industry offered back then, were the hopes and dreams of every daring entrepreneur venturing into a high-risk industry. And every single one of them, be it Bentley, Opel or Duesenberg, only aimed towards one goal – to build the best car they could. It was as much a sword fight of engineering prowess as it is a case of family pride. Most car makers came from engineering companies started by ambitious well-educated young men who likely had a foundry, steel smiths and tools to see what businesses can they get out of it. If there was an order, they’d build it. Nikolaus Otto was fiddling with the internal combustion engine and perfected its four-stroke cycle; he thought it’s an awesome industrial engine to replace windmills or water wheels. His employees thought this would be great if applied onto a tricycle - just like the French did with steam engine powered automobiles - way earlier than the Germans did. And amongst current surviving car makers with their humble roots beginning as a small workshop doing all kinds of engineering businesses, Peugeot is the oldest car company in the world where its roots helmed from 1810, a full 100 years earlier than most car makers. Steam cars, bicycles, you name it, Peugeot flourished through two centennials to be what it is today, owning Citroen and Opel, a group making close to 4 million cars a year. While most would immediately associate that four million cars to cheap and cheerful little French cars, there’s a reason why I brought up the psychology of these car making company’s founders earlier on. Peugeot invented the hard top convertible, Citroen invented Hydropneumatic suspension, Opel was Germany’s oldest car maker founded in 1862. None of them started off wanting to make an engineering product just to make money by selling to the masses. All of them begin with great pride, and today I want to talk about the new 508 that I just drove in Monaco. Yes, Peugeot picked Monaco as the backdrop of this new four-door family car - Oh sorry – four-door coupe. Yes, just as the 6 Series bid farewell as a Grand Touring car and turned itself into a shopping cart, Peugeot’s 508 shakes off its family sedan image and went all out challenging the likes of the Audi A5 Sportback, BMW 4-Series Gran Coupe, and of course the Volkswagen Arteon. Four-door coupe - Oh sorry - Four Frameless Doors Coupe. Just look at it, these are the kind of designs that you couldn’t absorb it all in within the first glance. There are just so many things awaiting you to explore. The daytime running lights dangling off the edges of the headlamps like a sabre tooth lion’s razor sharp canine teeth. The clamshell bonnet cover, the big opening hatch, and that interior that looks more in place for year 2025, all these are signs that Peugeot couldn’t care‍‍‍ less about competitor benchmarking anymore. All they want to do, is to make them as best they could. With the recent 3008 and 5008, I think Peugeot’s gonna score a third home run. The all-new Peugeot 508 rips the traditional D-segment copybook to shreds. Camry-Accord fighter? Please, this car has bigger ambitions. But first, what perplexed me are the smaller dimensions of this new 508. Apart from being just as wide as the old one, it is every one to two inches shorter, lower in every dimension, including a shorter wheelbase. This throws away one of the best things about the previous car, the road presence of a big car, the visual heft that it carries. I can’t help but wonder if this new one being similar to that of the size of a CLS then it would be pretty awesome. Nevertheless this is very clear, it wants a piece of that C-Class / 3-Series / A4 / Passat pie. And it wants more by offering exactly what this segment should’ve been at the first place - Premium Sports Sedan segment. With Peugeot’s credentials in creating great handling cars, there’s no reason why this isn’t something Peugeot could push itself into. And they’re being very pragmatic with the powertrain options too - none. Yes, the 1.6 turbo was troublesome when it was first introduced in the 308 Turbo, but a full 10 years later with countless of improvements and refinement, this is now a very refined powertrain. Fuel efficient, flexible, has tons of power, and fits the bill for every Peugeot. I won’t be comparing this 1.6 turbo with German rival’s 2.0 turbo because that would be a question of asking why a mug couldn’t hold a pint’s worth of beer. It is a smaller engine, and it should produce less power, case closed. How does the engine and transmission work together? Almost perfect. No qualms really, apart from the fact that at slow speeds there were intermittent hesitations between on and off throttle as if it’s a dual clutch or a torque converter with a lock up clutch. Other than that, the pairing and calibration is done exceptionally well. I was able to keep a constant throttle angle going up the mountain-climbing, long twisting tunnels in Monaco while the speed was kept at a steady 48km/h within the 50km/h zone. Every change in road angle was handled by the transmission cleverly switching between cogs to match my intended velocity in forward motion. Handling is very tidy, firm without being crashy, and comfortable without being rolly-polly. It’s of course not a Jaguar XE, but it seems more comfortable than the Volkswagen Passat. The handling of this car with the way it feels, being so light footed especially in corner to corner weight transfers,‍ also seems to best the Passat in agility and handling. The only part that left me wanting more is perhaps with regards to steering feel - I still recall how great th‍‍‍e the XE's is - oh don't ask, the 508's interior is eons ahead of the Jag's. As for comfort, sound proofing in the previous car was already great, and in this new one with frameless doors, I was expecting less but it seems they have perfectly executed it. It’s even quieter than driving a Volvo S90 in Malaysia from what I recall. But of course this is Europe, and their smooth roads does generate way lesser road roar from the tyres. The smaller body does contribute to a more agile car, and with this 1.6 turbo offered in two levels of tuning, 181hp and 225hp, can’t say I’ll find myself in need of anymore push. But regardless of how much pressurised air was forced through its waste gates, this new 508 is still a small capacity four cylinder. What that means, is that at times say slowing down for a hairpin and the hairpin is actually one with slight uphill, there is a momentary lapse of pressure build up in order for the turbos to spool. But that’s about it. Most of the time, the car just behaves like a docile feline quietly and gracefully throwing itself about without making much noise. As a conclusion, I think Peugeot nails this one big time, but also taken up a big risk, especially with regards to China and markets like Malaysia. The 508 name has been well solidified by a larger, almost 5 Series-sized Camry Accord fighter. The very first time a model was introduced but immediately established itself as one of the very best. And it is rather well received in a “big equals good” market like China and generally, Asians from developing countries. 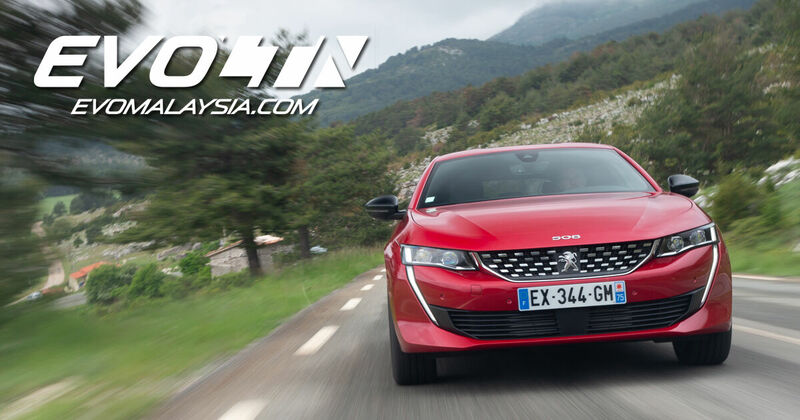 By completely giving up in this high-margin, high-growth market and turning the 508 completely around to a visually compact, sleek and stylish four door coupe, Peugeot might alienate the traditional D-segment buyers in China that generally refuses all things Japanese or Korean but were very receptive of European brands. Also, if Peugeot haven’t realised, they stand now as the only car maker with a naming convention so flexible, they can play around with it in a way that appears cleverer than all the number-nincompoopery the Germans are playing. If Peugeot wants, they can continue the 508 sedan as a practical big Asian Camcord fighter, as for this sleek beautiful four door coupe, Peugeot could go with 507, a wagon can be a 509, a cabriolet may be 506 and a coupe a 505. The same goes with all their other range as well. The question now is this, with such a beautifully executed platform, brilliant chassis and engine; will Peugeot be content with just a four door coupe and a wagon? I’m sure they want to do more with this, and by the time comes, they will realise what I mentioned made a lot of sense. Be ready for Peugeot 504, 505, 506, 507, 509? Hopefully. "Just look at it, these are the kind of designs that you couldn’t absorb it all in within the first glance"
"Every change in road an‍‍‍gle was handled by the transmission cleverly switching between cogs to match my intended velocity in forward motion." Perhaps seeing things from a different perspective allowed Peugeot engineers to create something truly special within its class.